A fantasy temporary track that is approximately 4400 mtrs long on the main track. 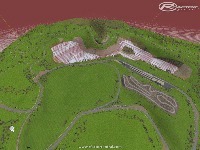 About 10 kms around the main and back track (yet to have objects and terrain finished). It is a fast flowing track with some nasty undulations and bumps around the place but it will reward you if you throw the car into it a bit. Made so far entirely in BTB with various Xpacks that will be credited once it is completed.